What a year! We look back on a wonderful, very successful, and exciting 2012. Hard work, thrilling product releases and terrific conferences. The year is not over yet and our team is already working on new innovations and features for upcoming releases. Nevertheless, it is time to recap the last year and to point out the Text Control highlights of 2012. We have sold our products with the software component reseller ComponentSource since their establishment in 1995. One of the first products sold by ComponentSource was TX Text Control. 12 leading publishers are listed as Enterprise partners and Text Control is one of them. The Florida user groups hosted their eighth code camp at the Nova Southeastern University in Fort Lauderdale-Davie: South Florida Code Camp 2012. We were very proud to be on site as a sponsor and exhibitor to meet the South Florida .NET community. Text Control was a sponsor at BASTA! Spring - the largest European Microsoft .NET focused conference. As every year, we sent a team to get your questions answered about the leading word processing components. Good news for our users in China and Korea. Beginning last year, we teamed up with GrapeCity to provide technical support and sales consulting in China. Now, GrapeCity Korea is our exclusive partner in Korea, located in Seoul. Scott Hanselman was the keynote speaker at the Nebraska Code Camp - a free, community-driven developer conference. As a gold sponsor, we were on site with our mobile booth. This annual event was held at the Louisville Marriott Downtown. They had a fantastic speaker line up including Billy Hollis and Chris "Woody" Woodruff. Text Control was the main sponsor of this event. We celebrated the Visual Studio 11 Beta release and the SQL Server 2012 launch. We unveiled the roadmap for 2012 and TX Text Control X8. Deeper in .NET 2012 was held on March 31, 2012 in the Expo Center at the Potawatomi Bingo Casino. We were proud to be a sponsor of this great event in Wisconsin. We were sponsoring another great community event in Germany: .NET Day Franken. This .NET focused one day conference is very popular - the tickets were sold out within several days. 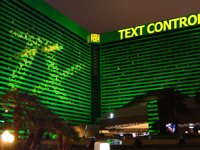 Text Control is European sales partner for Spread.NET. This spreadsheet processing component is the perfect addition to TX Text Control to embed programmable MS Excel and MS Word functionality into .NET based applications. The Carolina Code Camp came to Charlotte at May 5th. The Enterprise Developers Guild launched the first event in Spring 2005 and has been organizing code camps annually. As a Gold sponsor, we staffed a table at the code camp. We were very proud to support this great event in Charlotte. The Philly Code Camp is a biannual event run by the Philly.Net User Group. The first Philly Code Camp this year was held at the Penn State campus in Abington, PA on Saturday, May 12. We were proud to support this event as a Gold sponsor. More than 350 developers, architects and DBAs have come together to learn about the latest trends from great speakers. We sent our European conference team to this great event to showcase our latest developments and products. We were working closely with Microsoft to make sure that future versions of TX Text Control will run under the final release of Windows 8 and Visual Studio 2012. Text Control is leading again. Every year, the SD Times 100 recognizes companies, non-commercial organizations, open source projects and other initiatives for their innovation and leadership. It is the list, where every innovative technology company wants to get listed. Right on time for TechEd North America, we released the long awaited TX Text Control 18.0 Community Technology Preview (CTP) demo application. 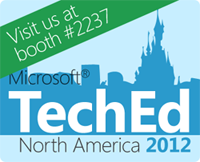 Again, Text Control exhibited at the biggest Microsoft conference in North America: TechEd North America 2012. We presented our brand new Community Technology Preview (CTP) of TX Text Control X8. It comes with full sources and can be deployed as your mail merge template designer royalty-free. It contains all features and functionality to create highly professional templates for your reports or other mail merge documents. As part of our porting services for migrating from another rich text control to TX Text Control, we introduced the possibility to convert your documents into a modern format that is usable in TX Text Control. We announced PDF Reflow. TX Text Control is able to import such "born digital" PDF documents, so that you can view, edit or convert these files. The main advantage of TX Text Control is that it is fully programmable. The PDF document is imported and can be modified just like any other format such as DOC or DOCX. The fully featured API can be used to change the content or to search on the document. We published TX Text Control X8 which was our largest ever release in terms of features and functionality. TX Text Control .NET for Windows Forms X8 now supports the insertion of chart controls of the type DataVisualization.Charting.Chart. It is part of the .NET Framework since version 4.0, but can be added to prior versions as well. Since version X8, the classes ServerTextControl and DocumentServer.MailMerge can be used within client applications without optional Server and run-time licences. We wanted to protect our users from decisions we have no influence in. It was not possible to get a definitive statement from Microsoft that guaranteed that ActiveX and COM is supported in future operating systems such as Windows 8. We are very happy to offer the ActiveX Subscriptions again. More than 900 enthusiastic developers met to connect, learn and share. We were a proud Platinum sponsor and exhibited at the Houston TechFest conference. With more than 120 sessions presented by numerous renowned speakers from around the world, BASTA! is corraling .NET developers from all over Europe into a nice venue for a highly informative week. Twice a year, we are exhibiting at this great conference. We published TX Spell .NET 3.0 with great new features such as an improved suggestion quality, customizable dialogs, new events and context menus. We were very proud to announce a new product line that was introduced at several conferences over the last months: TX Barcode .NET. TX Barcode .NET enables developers to integrate barcodes into .NET-based applications. We were very proud to be a sponsor of the GOTO Conference in Aarhus. It was an interesting melting pot of technologies and platforms: Microsoft .NET, Java, PHP or Perl. With more than 3000 registered attendees, it is one of the largest code camps in the United States. Over 200 speakers in 217 sessions at a very nice venue - the Foothill College in Los Altos Hills. It was a fantastic event in Wuppertal: NRW Conf 2012. Thanks to the whole Just Community team for the exceptional efforts making this conference an outstanding event in Germany. As an active member of the Microsoft Visual Studio Industry Partner Program and as an official Visual Studio 2012 SimShip Partner, we have committed to support new versions of Visual Studio and to make sure that our products work seamlessly with Visual Studio 2012. We announced a co-operation with our friends from RSSBus Inc. The combination of the powerful mail merge and reporting capabilities of TX Text Control and the high-performance RSSBus data providers gives developers a perfect tool set to create professional reports from various data sources. Since the release of TX Spell .NET, it is growing in popularity and now it is the best-selling spell checking component at the largest software component reseller ComponentSource. It was a fantastic conference week in Las Vegas at DevConnections 2012. We presented new features of TX Text Control X8, TX Spell .NET and upcoming features and technologies such as data-bound chart controls in our MailMerge component. We sent our very own LiveDocx evangelist Jonathan Maron to PHPConf Taiwan 2012 in Taipei to talk about our cloud service LiveDocx. More than 50 sessions were scheduled in 10 parallel tracks. 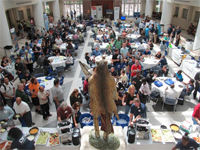 600+ attendees came to Penn State in Abington, PA. We are always glad to support this code camp as a main sponsor. We published some upcoming key features, products and technologies as part of our technology roadmap 2013.